The Pointer (also known as the �English Pointer�) was used in England to point hare as far back as the 1500�s. The Pointer was bred from the Foxhound, Bloodhound, Greyhound, and Bull Terrier. By the 1700�s it had become popular for locating birds and silently pointing toward them until the hunter was ready to shoot (which could take a while with the firearms available at the time). Pointers were popular with the noble class for sport hunting on estates; often two Pointers were used, which allowed the hunter to locate birds more quickly and accurately by following both dogs� line of sight. The Westminster Kennel Club, which organizes what is widely considered to be America�s most prestigious dog show, was formed in 1877 primarily to breed and display Pointers. A Pointer named �Sensation� is its well known emblem. Today, Pointers are popular hunting dogs for bobwhite quail, pheasant, and woodcock, particularly in the American South, where they are sometimes called simply �bird dogs�. Pointers are also popular field competitors, but not common pets. Judy, a Pointer who served aboard a Royal Navy vessel during World War II, was known for pointing out approaching Japanese planes before the crew had observed their approach. After the ship was sunk and the crew became POW�s, Judy assisted in smuggling the crew food and assisting where possible. After her death in 1950, Judy was awarded the �animal� Victorian Cross, which is on display in London�s Imperial War Museum. 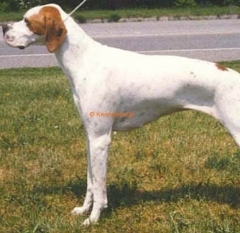 The Pointer has a shoulder height of 58-71 cm (23-28 in) and weighs 20-34 kg (45-75 lbs). It has a long head, deep muzzle, pronounced stop (depression where the muzzle meets the forehead), and soft, thin ears. Pointers have a straight, tapered tail carried flat and breed characteristic oval feet. They have a compact, alert appearance. The Pointer has a short, dense coat. Possible colors are liver, lemon, black, or orange; Pointers can be solid colored or white with colored speckles (�ticking�) or larger markings. Dark colored Pointers have black or brown noses and light colored Pointers have light colored noses. Pointers are gentle, sweet and kind. They are single-minded on the trail, but calm indoors if sufficiently exercised, enjoying downtime on the couch as much as the rest of the family. Pointers are very loyal and loving with their owners. The Pointer gets along very well with other dogs and shows no aggression towards cats or other household pets. Pointers are great with children, but puppies may a bit too boisterous for small children. Pointers do not mind strangers, but their large size and deep bark may frighten those who are not comfortable with them. The Pointer requires only an occasional quick brushing with a soft brush to remove dead hair and minimize shedding. It has a lifespan of 12-16 years. Pointers are generally healthy, but subject to common canine ailments such as hip dysplasia (malformed hip joint which can cause lameness or arthritis), epilepsy, and food allergies. Pointers can live outdoors with a soft bed and warm shelter but prefer indoor life with the family with access to a large yard. The Pointer is very intelligent, but is always on the lookout for birds. It has a short attention span and is easily distracted. Training should be varied to keep the Pointer�s interest. Obedience training is recommended. The Pointer needs at least an hour of strenuous exercise every day. Plenty of space should be provided for it to run and play. The Pointer is happiest when it has regular opportunities to hunt or run free in the outdoors.